As indicated by its name, it is used to have quick access to certain functions we consider as key functions. Let's see an example of this bar. This toolbar is very useful because it saves us time when we want to run a specific function. Besides, we can add those functions we consider useful or frequently used. 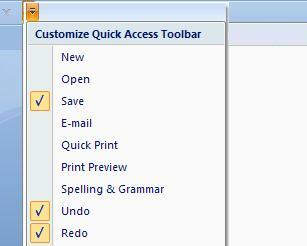 In other words, we can customize our quick access toolbar. To do this, we place our cursor over the arrow (pointing down) found on the right end of the bar and we click on it. It will open a drop down menu showing its available options. As you can see, there are many functions we can add. To add a function, for example Print Preview, we click on it or we press Enter. * Ruler, it allows us to see the size of the page and where the margins we will be using are located. The black arrow pointing up is used to move up on our document. We need to click on it to activate it. The black arrow pointing down is used to move the document down. We need to click on this arrow to activate it. * Previous page and Next page buttons. If we look at the lower right hand corner of the worksheet, you will find two pairs of arrows (one on top of the other). If we click once on those pointing up, we will move ahead one page. If we click once on those pointing down, we would go to the previous page we were working on or viewing. * On the bottom of the worksheet, we can see a small bar which shows three different states: the page where we are (working) from the total number of pages, the number of written words, and the language in which we are writing. * In the upper right-hand corner of the worksheet, we will find a small button used to view the ruler on the screen. If we click on it, the ruler will no longer be visible on our worksheet. If we click on it once more, it will be visible once again.